NOAA's Pacific Marine Environment Laboratory Carbon Program goes overboard on ocean acidification – leaves uncorrected error | Watts Up With That? An OSU researcher who gave the story to the Oregonian, Alan Barton, had incorrectly asserted that the ocean pH had risen 30% because of human CO2 emissions and gave that as the reason the oyster harvests had been suffering. And he qualified that statement by stating that the ocean pH had moved .1 unit towards acidity over the last century. But as you know, the equation for the pH of an aqueous solution is logarithmic and defined as pH = -log[ H+ ] . As you also know, there are 14 orders of magnitude that define the pH scale from zero to fourteen units as per this equation. So a movement of .1 units towards acidity cannot equal a 30% increase in acidity as claimed in this article. It is actually .1/14 or only 7/10ths of 1%. In order for there to be the increase cited, the researchers solved it for the hydrogen ion concentration and computed that change instead and called it the change in acidity. So if we moved .1 units towards acidity from the alkaline 8.2 to 8.1 oceans and compared the change, we have [delta H+] = 8 E-9/6 E-9 = 1.33 or a 33% increase in the hydrogen ion concentration, not an increase of 33% in the pH. None the less, that is how the story was reported and it is wrong. Since the natural variation of ocean pH can be up to 5% in either direction, I am speculating that in order to make the story seem legitimate, a gross exaggeration of fact was needed to sell it and hence the switch and bait tactic was used with the pH equation. In this explanation offered by NOAA, of which you are a senior scientist, we are back to the trickery of claiming the ocean acidity has increased by 30%. 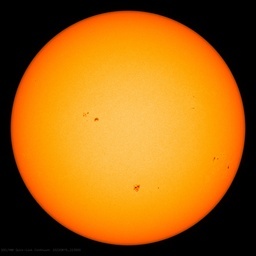 Are you aware of this NOAA information page? It needs an immediate correction. The ocean pH has been changing everywhere within natural variations. There is no provable decrease that can be identified with atmospheric CO2 that is related to human activity. Does Jane Lubchenco understand this? She has made numerous and completely false assertions that the up welling ocean water off of the Northwest coasts ( that will be on the rise because of the switch to cold phase PDO in 2007 that will run thirty years and likely decrease the pH additionally ) is attributable to human caused climate change. There is absolutely no proof of this and as far as meteorologists can tell, the mid and north Pacific Hadley cell summer circulation has intensified on schedule and is behaving perfectly normally in the cold phase of this ocean cycle. Either you or Lubchenco need to correct this page. It is misleading the public. ← Bizarre: Farm workers threatened at gunpoint for 'causing global warming' by harvesting crops. It’s even more complicated than that, because there are buffers involved. BTW, the original reason for the logarithmic scale isn’t to take into account the wide range of concentrations, it’s because the electrochemical potential of a pH probe is logarithmic; i.e. the millivolts from a probe are directly proportional to pH. It was an easy way to measure without converting the other way. Does Jane Lubchenco understand this? She understands that she could announce the Pacific will turn into hydrogen sulfide in 30 years and not a single Letter-to-the-Editor would ever see print. Mass fraud. Science’s version of Wall Street and the City Of London. Go LONG on piano wire. Absolutely correct, Chuck. Their lazy attitude towards correct science displays a tendency all too familiar. It is being assumed by these people that the ocean obeys the second law of thermodynamics, it does not because of surface tension. You can not heat water from above on this planet which may be why the oceans are still here. If surface tension stops heat what chance has a co2 molecule of passing through. As far as I can make out the only thing that penetrates the oceanic surface tension is the sun’s rays. Because of surface tension AGW can not exist. I don’t think that Chuck is incorrect in this instance. The pH scale is open-ended, not limited to the range 1.0 to 14.0. That is not a huge error in itself, but the fact that the ocean is buffered amplifies the significance of the 30% increase of hydrogen ion concentration, not diminishes it. This is a large change in acidity, contrary to claims made here. Please be careful to distinguish between hydrogen ion concentrations and pH. While these are interconvertible, they are not identical. If your speed where to increase from 50 mph to 100 mph, the logarithm (base 10) of your speed double from about 1.7 to 2.0, roughly an 18 percent increase. I think a judge would be very unimpressed by your argument that you were only faster by 0.3 log units. IPad auto-corrupt is the Bane of us all. This is rather funny. If there is one thing farmers and ranchers know how to do, it’s measure pH. Some things need soil less alkaline, some things need soil that is very sweet, and some things need soil that stays in the middle of neutral. But we are talking small movements one way or the other. pH that changes by 30% towards acidic would be…crazy!!!! You would have dead fish floating on the water for heaven’s sake. And just plain ol’ flat-earth rednecks would know this! How embarrassing. If she wants to get ahold o’ me, I’ll aks my neighbor Bubba if’n he could walk her through the process of pH measurement. Ya know, we git these kits down at the Grain Growers fer next to nothin so I’m sure he would do it fer ya. Things like this go to the heart of credibility. Uncorrected errors damage the reputation of the parent and wall as the credited author. It goes way beyond this though. There is a huge move in Canada to make sure only PR people speak for any Federal organization. The present control freak Prime Minister does everyone a great disservice by attempting to control the message. Foolishness like this are the result of such an approach. People who have few if any clues about things such as physics and chemistry create or miss the error specifically if it supports their bias. It is simply another form of the big lie. Niccoló Machiavelli, would be proud. Chem Prof, how large? In pH terms please, not in hydrogen ion terms. The oceans are infinitely buffered. That is why rainwater (<5.2 pH) can continuously fall on the surface of the ocean all day long with no change in the ocean's pH — not even on the surface of the ocean — because, it mixes so quickly and thoroughly (in fact, the pH of the ocean actually decreases the deeper you go). Any a move toward a lower pH would simply cause CaCO3 to dissolve and bring the pH right back up. I just read the article “What is Ocean Acidification”. It contains a gross error in the change of pH of the ocean. A pH change of .1 corresponds to a change in hydrogen ion concentration of ..007%. Acidity, in chemical terms, refers to a pH of less than 7. So a correct description of what has happened is that “the ocean has become .007% less basic”, not “30% more acidic”. The section on Pteropods shows a meaningless experiment. The pteropods don’t exist in a sterile solution of water at pH 8.0. The oceans include millions of tons of carbonate salts and are in contact with millions of tons more. A more realistic experiment would be to put a lump of limestone(calcium carbonate) in the beaker too. Such a wide variation in ocean pH indicates mainly that we don’t know very much about how or why it changes, the reason for the new Scripps study. I don’t expect the article to be re-written though. The original article is correct. A decrease in pH by 0.1 pH units corresponds to a 25.6% increase in relative hydrogen ion concentration, roughly 30 percent to one significant figure. Sorry mods tips and notes slow. A pH of 8.2 = 0.00000000630957 mol/L H+ ion. A pH of 8.1 = 0.00000000794328 mol/L H+ ion. BTW: pH is not strickly from 0 to 14, you can have negative pH, for example, a 66 degree Baume (~93%) sulfuric acid’s H+ concentration is way higher than 1 mol/L hence has a negative pH. @ Chem prof (yea, right): Where do you “prof” (cough, cough) “chem”? I’d like to send a link to your department head. I must be very stupid but if Chem Prof is right and ocean pH is currently around 8.1 then for it to become acidic the relative hydrogen ion concentration would have to increase by about 280%. How would this be possible and at what point would the sea consist entirely of hydrogen ions? Sorry if I’m letting my scientific ignorance hang out but I suspect that the “denizens of the deep” would be struggling to tell the difference between pH of 8.2 and a pH of 8.1. On the other hand I would have thought that a 25.6% increase in just about any component part of the sea would have been evident to even the dimmest of sea creatures. I don’t think that Chuck is correct in this instance. The pH scale is open-ended, not limited to the range 1.0 to 14.0. That is not a huge error in itself, but the fact that the ocean is buffered amplifies the significance of the 30% increase of hydrogen ion concentration, not diminishes it. This is a large change in acidity, contrary to claims made here. Please be careful to distinguish between hydrogen ion concentrations and pH. While these are inter-convertible, they are not identical. If your speed were to increase from 50 mph to 100 mph, the logarithm (base 10) of your speed would increase from about 1.7 to 2.0, roughly an 18 percent increase. I think a judge would be very unimpressed by your argument that you were only faster by 0.3 log units, and would certainly disagree with any assertion that your speed had increased by merely 18%. The original article is correct. A decrease in pH by 0.1 pH units corresponds to a 25.6% increase in relative [ and I emphasize RELATIVE] hydrogen ion concentration, roughly 30 percent to one significant figure. I have no idea what John West’s complaint is. I think Chem Prof is correct. pH is logarithmic to base 10. This could loosely be described as a 30% increase. John West, I’m not sure why you’re having a go at Chem Prof. If “acidity” is understood as the hydrogen ion concentration, then a 0.1 pH unit decrease change in pH from 8.2 to 8.1 is an increase in hydrogen ion concentration from 6.3096 E^-9 to 7.9433 E^-9, or 1.2589. pH is the negative log (base 10) of the hydrogen ion concentration a (sub H^+). i.e., a 26% (25.89%) increase, not a 30% increase in hydrogen ion concentration. The greater issue is people do not understand that to become “acid”, the ocean acidity would have to increase 15,850%. Far more importantly, is the importance of “chemical buffers” in the Ocean that will effectively prevent the ocean from becoming “acidic”. An increase in atmospheric CO2 will namely increase the buffer capacity of ocean water, and thereby strengthen the ocean’s capacity to moderate an increase of atmospheric CO2; maximum buffer capacity for the system CO2 – H2O is reached at 2.5 to 6 times the present atmospheric partial pressure of CO2, depending on temperature and alkalinity (Butler, 1982). According to Maier-Reimer & Hasselmann (1987) the borate system also increases the ocean storage capacity for CO2 by more than 20% over an ocean with the carbonate-system alone. Furthermore, this carbonate buffer is not the only buffer active in the atmosphere / hydrosphere / lithosphere system. The Earth has a set of other buffering mineral reactions. The geochemical equilibrium system anorthite CaAl2Si2O8 – kaolinite Al2Si2O5(OH)4 has by the pH of ocean water a buffer capacity which is thousand times larger than a 0.001 M carbonate solution (Stumm & Morgan, 1970). In addition we have clay mineral buffers, and a calcium silicate + CO2 calcium carbonate + SiO2 buffer (MacIntyre, 1970; Krauskopf, 1979). These buffers all act as a “security net” under the most important buffer: CO2 (g) HCO3- (aq) CaCO3 (s). All together these buffers give in principle an infinite buffer capacity (Stumm & Morgan, 1970). I hate chemistry, but I agree with Chem Prof here in support of the 30% claim. Acid strength is ultimately just a measure of how fully dissociated the acid is in water. As far as I can tell the accepted definition goes from a min(max?) of 0 pH (or 100% dissociated) to a limit arbitrarily close to no dissociation (infinite pH). Since pH is logarithmic, a 30% increase in the hydrogen ion concentration only gives rise to a 0.1 shift in the pH scale, but the solution is 30% more acidic. As an aside, has anyone bothered to calculate just what the ocean pH should be assuming that all of the CO2 we emit goes into solution and the ocean is perfectly mixed? Is the 0.1pH mean shift consistent with that? Great care has to be taken about claims in PH changes. “Since 2000, we have been monitoring physical ocean conditions, including ocean pH, at our main study site in the northeastern Pacific Ocean: Tatoosh Island, Washington, USA. We use a submersible data logger to record water conditions at 30 minute intervals, yielding a dataset of very high temporal resolution (>40,000 datapoints total and growing) to explore changes in pH through time. I bet $5 this letter gets DR Feely touchy. Chem Prof: 30% increase in a very low H+ concentration is like the interest on one lefta (100th of a dracma). To increase acidity form 8.2 to 8.1 in volves an increase in [H+] of about 25%. To increase it from 8.2 to 7 involves an increase in [H+] of 1600%. To increase pH from 8.2 to 1.0 requires an increase in [H+] of… wait for it good doctor… 1584893200%. If you still think your 30% increase is significant, you should turn in your doctorate – egad who are these people teaching our children. I certainly wouldn’t call myself “Chem Prof” if you don’t understand pH. Indeed divide your 30 by this figure to get an idea of how insignificant it is. The pH of seawater plays an important role in the ocean’s carbon cycle, and there is evidence of ongoing ocean acidification caused by carbon dioxide emissions. However, pH measurement is complicated by the chemical properties of seawater, and several distinct pH scales exist in chemical oceanography. As part of its operational definition of the pH scale, the IUPAC defines a series of buffer solutions across a range of pH values (often denoted with NBS or NIST designation). These solutions have a relatively low ionic strength (~0.1) compared to that of seawater (~0.7), and, as a consequence, are not recommended for use in characterizing the pH of seawater, since the ionic strength differences cause changes in electrode potential. To resolve this problem, an alternative series of buffers based on artificial seawater was developed. This new series resolves the problem of ionic strength differences between samples and the buffers, and the new pH scale is referred to as the total scale, often denoted as pHT. However, the advantage of considering this additional complexity is dependent upon the abundance of fluoride in the medium. In seawater, for instance, sulfate ions occur at much greater concentrations (> 400 times) than those of fluoride. As a consequence, for most practical purposes, the difference between the total and seawater scales is very small. In practical terms, the three seawater pH scales differ in their values by up to 0.12 pH units, differences that are much larger than the accuracy of pH measurements typically required, in particular, in relation to the ocean’s carbonate system. Since it omits consideration of sulfate and fluoride ions, the free scale is significantly different from both the total and seawater scales. Because of the relative unimportance of the fluoride ion, the total and seawater scales differ only very slightly. The upshot of all this, especially considering the third sentence from the end, is that changes in acidity must be clearly demarcated in terms of which scale is used for measuring pH in seawater. This makes manipulating pH measurements relatively easy and can cause problems when different buffer solutions are used to set the pH meter. It would be nice to see just how the acidity changes (pH measurements) mentioned in the thread were derived. Until that is done, the 30% increase in acidity, buffered or not, is meaningless. Chem Prof: In all of the work- ups and computations I have seen NOAA and others do when talking about ocean acidity, the units have always been referenced in units of pH. I have never seen work- ups in ion concentration. If you look at mappings of global ocean pH, we see it varies naturaly by up to 5% of pH units in either direction from the mean of 8.2 pH units. A change of .1 units of pH is well within the natural variability of 5% of 8.2 pH units, so there is no legitimacy to the story if it was looked at in this manner. But if you use ion concentration, you get well outside of the 5% variability of pH units. I suspect that is why they did this. To sell a scary story to the public to convince the voting public action is needed to sequester atmospheric CO2. But the fact of the matter is, there is no case to be made for this with the data provided and they misled the public when they reported the “findings” in this manner. BTW, my computation of 33% was off of the mean global ocean pH of 8.2 units moving to 8.1 units. Close enough to the relative numbers to see what was done here. And contrary to your claim, hydrogen ion concentration is not a unit of pH. The equation speaks for itself. Hey Chuck, we’ve known for some time now that these people are liars and frauds. It is sure taking a long time for them to be held accountable though. As for the Oregonian, they sent me free newspapers for several months right up until the day after the recent election. I wonder who was paying for that scam. PS I used the newspapers for firestarter and chicken box liners. I hope I didn’t diminish the intelligence of my chickens. And I voted my consience which does’nt allow me to vote for any liberal and very few so called conservatives. Ron Paul for president is my hope in the political arena as I think with anyone else it will be more of the same corruption. Will tiny variations in Ph matter in a Pacific now Japan’s nuclear waste dump with hundreds of trillions of bequerels of the most toxic radioactive metals on the planet trickling down through the water column, Pacific-wide? 100% of the Blue Fin Tuna off San Diego have Cesium 137 in them. Ph won’t matter…at all. Why is the news blackout so total of this disaster? It’s criminal. Take a close look at “Fig.9.10 Schematic representation of an open system, consisting of a water mass in exchange with an infinite CO2 reservoir and with carbonate rock. The X axis is in PCO2 in the water in atmospheres, remember two things: 1) PCO2 in the water always less than PCO2 in the air it’s in equilibrium with due to Henry’s Law and 2) if they had labeled the X axis in ppm relative to the atmosphere then 10^-5 would be 10 ppm, 10^-4 would be 100 ppm, 10^-3 would be 1,000 ppm, 10^-2 would be 10,000 ppm and so on. Note the logarithmic relationship between PCO2 and pH; yes another manifestation of the law of diminishing marginal returns strikes. Also note the Y-axis is alkalinity which is basically a measure of a solution’s ability to resist changes in pH. You’ll see the alkalinity, salinity, and total carbon dioxide vary in conjunction with each other on very short time scales and there has been no trend since they started taking samples in 1990. Thanks to things like Henry’s Law, the logarithmic relationship between pCO2 and pH, and Carbonate alkalinity we don’t IMO have to worry about “Ocean Acidification”. How should one interpret the above? My interest in pH is trying to make blueberry plants happy. The little buggers like acidic soil. The irrigation water has dissolved minerals. See the problem? The link above shows a graphic of ocean alkalinity in the 1990’s from Wikipedia. Note the low alkalinity off the NW coast of North America. This makes the 30% increase statement even more bizarre as a “scientific” assertion. Hurrah Wagathon! Someone finally gets it right! Unless you disolve (pretty much the entire planet (ok that’s an overstatement, but not by much)) you’re not going to move the ocean’s pH by much. Look up alkalinity to start. It’s not as easy to move the ocean’s pH as the layman would think. Or that of a 100 gallon saltwater aquarium for that matter. As with surface temperature and salinity, pH can vary a bit from place to place, and by a bit I mean tenths. Reading some of the crap posted by some folks, you would be shocked to go to some bays and estuaries and take simple water sample measurements and see the resilience of ocean life. Just like the water temperature debate, it is a trivial thing to GO into the ocean where the water temperature swings 25F over the course of a year and observe that it all doesn’t just die, but thrives. Except maybe you only go to the ocean a few times in your life and don’t realize these things swing widely over the year. At some point please begin to realize this planet is huge and has been around a long time. It has survived worse than us. Does anyone here know why we keep being told that the pH value of the oceans has changed by 0.1 since the start of the Industrial Revolution ? Is there a time series of actual measurements going back that far ? If not, how far back does the longest time series go ? Is this value based on a proxy ? If so, is the causal relationship well established both qualitatively and quantitatively ? This is a serious question if anyone knows the answer. @ Dave Hagen: Yes, your numbes are more precise than mine when you include the the numbers right of the decimal point in the mantissa. I just solved for H+ and my Texas Instrument 30XA calculator rounded the numbers in both directions to the nearest whole number. That left precisely the margin of error that reduces the ion increase to 26% rather than 33%. They called it a 30% increase in acidity in the article, but you get the picture. Tatoosh Island is at the entrance of the Straight of Juan De Fuca. That there is complexity in the ph of the water found there should come as no surprise given the raw sewage from Vancouver Island, the outflow of all the rivers of Puget Sound, and the by-products from the industrial base found in Puget Sound which itself is a bit of a toilet bowl. I think they are wasting their time monitoring the ph of the ocean at Tatoosh as there is zero chance it reflects a global norm. Just my opinion but I suspect they will learn more by talking to the oyster farmers in the area. Boys and girls there are no angels on the head of this pin. Assuming that the ocean has warmed due to CO2 concentration and then saying that the relative alkalinity of said ocean has decreased by this selfsame CO2 leaves one with a circular argument both ends of which are disproved by the physical properties of the CO2 and the ocean. The discussion got pretty pissy. I wonder whether people actually read and understood what others were posting. For example, unless I missed something important, ChemProf was right on. How do we gain by creating a circular firing squad? Let’s focus on the real culprits, not each other… unless you are a troll, then you’re fair game. I’ve always been taught to run the numbers. Only this time I don’t know how. According to Wikipedia, the volume of all of the oceans is 1.3 billion cubic kilometres. The letter says the pH change is from 8.2 to 8.1. Does anyone know how much CO2 it would take to change 1.3 billion cubic kilometres of salt water from pH 8.2 to 8.1? A pH change from 8.2 to 8.1 cannot be truthfully described as ‘becoming ‘more acidic’. Something which is not acidic in the first place cannot become ‘more acidic’. Saying a change from pH 8.2 to 8.1 is ‘becoming more acidic’ is like saying a grossly obese person who loses a few pounds weight is becoming ‘more anorexic’. Because even though the numbers do calculate to roughly 30%, it’s incredibly inappropriate to apply percentages with pH. 0 its like a 100000000000000% change, Making 30% seem much more insignificant than the 30 out of 100 implied by using percentages. Any real chemistry professor wouldn’t hide behind anonymity and support such a misleading practice, IMO. Will tiny variations in Ph matter in a Pacific now Japan’s nuclear waste dump with hundreds of trillions of bequerels of the most toxic radioactive metals on the planet trickling down through the water column, Pacific-wide? Larry, why don’t you hide in your basement if you feel that way? No, wait … radon and the daughters of radon (polonium 218 > lead 214 > bismuth 214 > polonium 214 > lead 210 > bismuth 210 > polonium 210 > lead 206(stable)). Don’t ever let me catch you eating mussels, they accumulate Polonium 210: http://www.radioecology.info/Bergen2008/proceedings/16.%20Carvalho%20O.pdf. Be careful with travel too; some beaches in Brazil and India and an area in China have a high occurrence of monazite, a mineral containing thorium, uranium and radium. There are megabequerels everywhere – don’t touch that banana! NOAA should know better than this, it is a schoolboy error of such magnitude that it makes a laughing stock of the organisation. Lets hope this gets posted everywhere and show the world what a bunch of amateurs they really are. This was no error, it is deliberate and part of the “communication of climate change” strategy. Jane Lubchenco has a video on the NOAA website where she adds vinegar to a flask containing a stick of chalk. Lo and behold, it fizzes and starts to dissolve. This is what is happening in the oceans, don’cha know. In 2009, Lisa Suatoni of NRDC, did the vinegar trick in the shockumentary, “Acid Test: The Global Challenge of Ocean Acidification”, fronted by Sigourney Weaver. Appearing in the film was Professor Stephen Palumbi, of Stanford University’s Hopkin Marine Station. He also has a video using the vinegar trick, showing how vinegar will dissolve coral. It is for school children. Also from Stanford, at the Department of Global Ecology at the Carnegie Institution for Science and another “Acid Oceans” film star is Dr Ken Caldeira, who helped to kick start the current scare in 2003, (Caldeira and Wickett), a paper which was quoted extensively in AR4: Working Group I: The Physical Science Basis, 5.4.2.3 Ocean Acidification by Carbon Dioxide. Hence we get the claim that “the ocean” has become 30% more acidic since the start of the industrial revolution. In 2005, the Royal Society published a report entitled, “Ocean acidification due to increasing atmospheric carbon dioxide”. The members of the committee producing that report included one Dr. Ken Caldeira, at that time at Lawrence Livermore laboratory. He was accompanied by scientists from UEA and Tyndall Centre affiliate institutions. This happens all the time, different institution, same people, same data, equals yet more consensus. No posting on the record heat, storms? I’m a fan of WUWT, and I worry that Chuck’s letter will not improve WUWT’s credibility. It seems clear that Feely reasonably thinks of ocean acidity in terms of hydrogen-ion concentration. A change of 0.1 in pH is, rounding roughly, a 30% change in hydrogen-ion concentration. No big deal. In fact, it would be quite peculiar to talk about percentage changes in pH: percentage changes, by definition, refer to changes in the “distance from zero”, but zero on the pH scale has no special significance, being where it is merely because we happen to measure volumes in liters and define a mole to be 6×10^23 things. Talking about percentage changes in pH would be like saying that a temperature of 60 degrees Fahrenheit is 20% warmer than 50 degrees. Yes, you could say that, but it says more about your way of measuring temperature than how hot it is. Ignore the fact that 30% is trivially different from 25%. Ignore also the nitpickery that the acidity isn’t increasing; the alkalinity is decreasing. Acidity is the concentration of hydrogen ions in solution. This has, indeed, gone up by roughly 30%. The paragraph above [quoting Barton] is correct, or reasonably close enough to it for normal journalistic standards. Chuck Wiese has created a tempest in a teapot at best and, more likely, has erroneously accused Barton, et al, of error regarding the paragraph. It is highly unlikely that the oyster problem is due to lower alkalinity, however. I suspect BOD is the culprit. Same reason for no posting of record cold in other parts of the world such as New Zealand, the South Pole, and Finland – it’s weather. NOAA plays with the numbers. Normally, a scientist would use a pH scale to describe the acidity. NOAA uses two units of scale in its statement; pH and concentration. However, the statement implies only the pH scale. This would mislead the general public. A mile down under the sea, in the warm water by deep-sea vents, CO2 exists as a “liquefied gas.” Little trickles come oozing out of the vents and wander off along the sea bottom. I really can’t think of a better way to dissolve CO2 into sea water than that combination of hot water, high pressure, and warm and liquid CO2. The funny thing is that the critters down there don’t look like their shells are dissolving. In fact, the crabs seem to be dancing in the flood lights and smiling at the sub’s cameras, happy as the clams. There’s technically right and there’s actually right. Humans use a range of scales for good reasons, and it is important to use the relevant ones for those reasons. pH is (negative) log because that is how organisms perceive acidity. They don’t perceive it in a linear scale, so it shouldn’t be quoted in one. No-one, but no-one talks about acidity other than via pH. As a Chemical Professor – cough! – you will be aware that there is a p[OH] measure too. So why not quote the alarming story that – oh noes! – hydroxide concentration in the oceans has fallen by 80%. I would hope you would see how stupid it was to use it, regardless of being technically true. Scientists should be above misleading statistics in order to add scare value. The end effect is not that they persuade, but that their statements come to be read in the same way we read politicians’ statements. Scientists have a measure of acidity that they should use, not play hocus-pocus with whichever number does their propaganda job better. The argument about ocean acidification is absolutely stupid if all the co2 in the world were added to the oceans it would still be above the ph of pure water. It would still be on the side of alkaline and not acid. Of course we would all be dead for there would be no plants and no food and as we ourselves are carbon based we would all end up looking like the brains of warmists. Chem Prof, your arguments (be they hydrogen ion concentration change or pH change) make no difference whatsoever. The change discovered is within the natural variability, IE the null hypothesis, which still stands. When natural variability is buried by the supposed anthropogenic CO2-pH mechanism, post again. The sky is not falling just because a walnut hits your head. Once again the “ocean acidification” canard is resurrected by grant-seeking science charlatans and global warming alarmists. 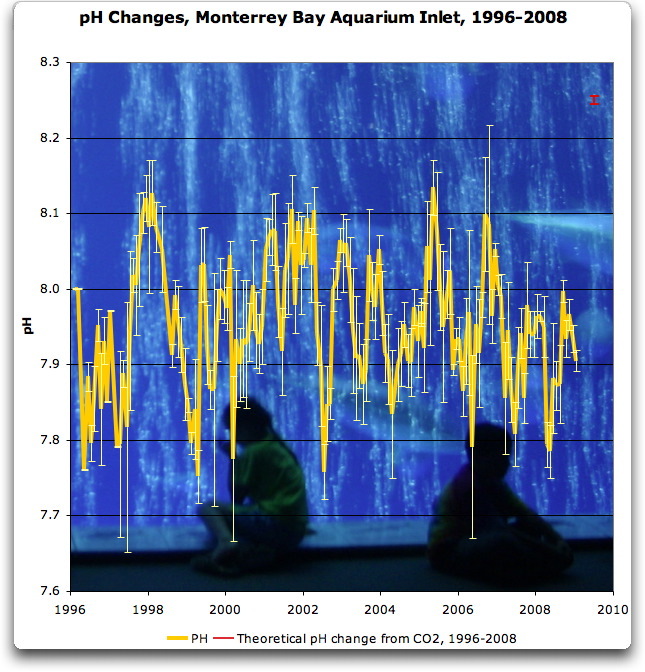 The problem is that in measuring ocean pH, the error bars are larger than the imagined change. Statistically, there is no change in pH. Please send $15 billion plus $5 billion per year. POGO are busy little bees. Over the next year they have scheduled about 36 meetings and workshops in places like India, China, Brazil, Usa, Hawaii, France, Japan, Australia and ….er…. Hull in the UK. The researchers admit that the alkalinity decreases when cold water from massive upwellings move into the oyster growing areas. It is well known that there are numerous active underwater volcanos and black smokers along the coast that emit CO2 and SO2. The San Juan Plate is nearby and active. These sources may well account for virtually all of the reduced alkalinity. Moreover, it is well know that Pacific oysters are intolerant to relatively small decreases in water temperature. A few degrees below the norm means death to oysters and their ability to reproduce. When water warms, the oysters begin to grow again. I have observed this phenomenon several times while cruising along the British Columbia coast and visiting well known prolific oyster growing warm water fiords. Oysters come and go when water temperatures vary by a few degrees F.
The researchers make no mention of the influence of reduced water temperature on oyster viability, which can falsify the hypothesis. Moreover, they appear to have ignored the impact from underwater activities that put massive amounts of CO2 and SO2 into the water. These acid making gases may well be the primary cause of reduced alkalinity and also falsifies their hypothesis. My layman’s understudying of scientific method is that those advancing a hypothesis have the burden of proving it, and disclosing and disproving contradictory facts, data and research. I suspect the cost of analyzing and quantifying sources of absorbed CO2 in sea water may be enormous, that is assuming that it is feasible. Presumably the CO2 concentration went up from 280 ppm in 1750 to 390 ppm today or about 39%. If you were in a room where the CO2 was 280 ppm and then went into a room where the CO2 was 390 ppm, do you think you would notice? Now as for the pH discussion here, any change of 0.1 in the pH changes the hydrogen ion concentration by 26%, but there is a world of a difference between a change of pH from 1.1 to 1.0 versus from 8.2 to 8.1. 26% of peanuts is still peanuts. Pamela, you’re the poster child for my previous comment. Chem Prof’s 30% increase is reminiscent of our long lost friend R. Gates who was fond of crowing about a “40% increase of CO2”. Technically correct but as many pointed out to him, a 40% increase of squat is still squat. Anytime I see percentages being used my skeptic alarm goes off loud and clear. The reason the change in pH is meaningless in this situation is that in a pure system where only H+ is considered to be driving pH, the change is one gram of hydrogen ions in one billion liters of water. So if things have now become dangerous at the part per trillion level of change life should hve been wiped out billions of years ago. Rather, it’s a Machiavellian attempt to deceive with a technically correct obfuscation. The average reader will think that we’re 7/10ths of the way to an acid ocean. If this were an ad that employed this deception, liberals would be screaming about it. Chem Prof misses the point, it’s NOAA’s carefully chosen misleading words that can leave many readers with a misunderstanding. To many readers, the pH scale is a meaningless scientific figure, so a science writer is expected to interpret this pH figure into a figure or statement of impact that the reader can understand. To many non-scientific readers this implies a hugely significant increase in environmental impacts – 30% more acidic ! NOAA compound the misleading nature of this statement by not making it clear that this is a reference to a percentage change in hydrogen ion concentrations. NOAA don’t need to use the misleading acidity figure – their follow-up paragraphs (under the heading “The Biological Impacts”) are adequate for explaining the claimed impacts. The whole sea water PH measurement story is a false numbers game. Anytime someone states a percentage number, your first question should always be a percentage of what? Geez, it’s a 30% increase! Oh, and just what constitutes a 100% totality? Assuming that 100% is the whole enchilada, the absolute total sum. In my mind and in the minds of many people, 30% is a change of magnitude almost 1/3 of the total. But but, says the alarmists, our 30% number is relative. It represents a percentage change from a ridiculously low number to another ridiculously low number so the ‘relative’ change looms very large. What? Says the the questioners (us) just what is that percentage as a total of the whole? On a scale from 0 – 14 the percentage change from 8.1 to 8.2 or versus-visa is truly trivial. So is trying to relate ph measurement to the richter scale. Ion changes per liter of water just don’t relate to 700 km of faulted continental crust slipping slipping meters. Yeah yeah, it’s all relative. As popularized by Mark Twain and others: “There are lies, damn lies, and statistics.” Someone should bring Darrell Huff’s 1954 book, “How to Lie with Statistics” out of mothballs, and update it with all the ‘scientific’ examples that are currently rife in the arena of AGW scaremongering. The article kind of sounds like they were using the scariest sounding way to report the number. “30%” sounds much bigger than “0.1”. Pretty common trick if you’re trying to influence rather than simply report. I don’t know the actual numbers here but when they try to demonize insurance companies they report their profits grew by, say, $10,000,000,000. If they are not out to demonize then they report their profits grew by, say, 1%. The honest thing would be to report both. So it seems that it’s just more lazy scientists at work. The global Ph is not the problem. It’s a local problem that might take some research and effort to work out. Unfortunately the oyster farmers succumbed to temptation, went to the worst possible place for accurate information, and got the party line…..global warming. They’ll get no sympathy from me. You do not appear to have been paying attention during your Nucleonics class in engineering school and have gotten yourself unnecessarily excited. Lets look at the radiation released at Fukushima: 13,600 TBq of Cesium-137. There was some Iodine-131 and some Cesium-140 released as well but this has half-lifed itself out of significance. The ocean volume is 1386000000 cubic kilometers. Dividing the released radiation by the ocean volume: 13,600 TBq/1386000000 km3 = .0000098 Bq m-3. For comparison, the ocean background radiation is 2-3 Bq/m-3 for Brazil and 35.2 Bq m-3 for the Baltic Sea. The radiation from Fukushima isn’t just insignificant – it is barely measurable. The ICRP in 1928 adopted the linear no-threshold model for radiation and there is no conclusive science evidence that it is a valid model. There is a lot of evidence that it is not. Normal background radiation is 2 mS (milliSieverts) per year – 15% is produced by your own body. This is a global average, the rate varies by location: the US background rate is 3.6 mS/yr, the Australian rate is 2.4 mS/yr, and the rate for Ramsar, Iran(whose residents have an abnormally low cancer rate) 260mSv . The radiation level for optimum health is 120-200 mSv (milliSievert) annually (hormesis hypothesis). The radiation level has to reach 2 Sieverts/year before cancer mortality is as high as the death rate from normal background radiation. Allowing radiation levels up to 2 Sv/yr will save lives. The reason that there is no news is there is no disaster. The lost of equipment, power (due to damaged equipment) and contamination of the nearby land does get reported. What is really amazing is the TEPCO (Japanese) staff bravely dealt with reactors that had gone uncooled for 24 hours.and managed to contain them. I doubt American staffs would have done as well. I’ve experienced a 100% increase of Labatt Blue content in my body since I started reading this comment thread. Incidentally, I was so intrigued by the scientific discussion that I neglected my second open bottle for a while. Otherwise I’d have been tempted to go to the source one more time and my mathematical models suggest that I would have suffered a catastrophic 200% volume increase. I have three problems with the statement about a “30% increase in pH”. First, we have no observations saying it has changed that much, just claims without actual data to support them. Second, applying percentages to logarithmic scales doesn’t work. The scales are logarithmic for a reason. Looking at that, should we be concerned about a claimed change since 1750 of 0.1 pH units? I say even if it were real it’s lost in the noise, it changes much more than that in a couple weeks in Monterrey. Now, let’s provide some context for the changes in Monterrey in percentage terms. In a few weeks, the water there goes from a pH of 7.7 to a ph of 8.2. According to the method used in the article and approved of by the “chem prof”, that’s a change of about 316% in a few weeks … and we’re supposed to be upset by a claimed (not observed but claimed) increase of 30% in 250 years? That’s why context is crucial, whether you measure in pH units as you should, or in percentages as makes no sense … either way you need context. I’m not going to sit here and point out the stupidity of using percentages on a PH scale but it got me thinking can anyone think of a valid use of percentages in pure science (You know science applied to real world data and measurements and not pulled out your ear to prove your worth your grant), or is it just used by bankers to push up and down the price of the stock markets and bonds, etc or stats guys to keep themselves in jobs (Mr McIntyre has changed my mind on stats guys though)? As usual Willis, you put it so well. Same reason for not posting of “the coldest and wettest April to June in at least 100 years” in UK. We are, officially, still in a drought!!!!!!!! Jane Lubchenko did a famous (reported here) demonstration (experiment) to show that corals can grow in ordinary (fresh) tap water, including presumably its chlorination, and dental fluoridation, if you simply dye the water blue with an ordinary “laboratory blue dye”. You chemistry whizzes (I ain’t one) can explain why you go around dyeing things blue with “ordinary laboratory blue dyes”. Back in school when I was actually forced to do some chem experiments, we used some gunk called phenolpthalene; or words to that effect, to determine the pH of some solution or other, similar to litmus paper I guess, but we never deliberately dyed anything blue to grow corals in it. Then friend Jane chilled the hell out of the blue tap water with dry ice to show that corals won’t grow in cold tap water. As I recall the cold tap water went yellow; which I assume explains why sometimes snow is yellow and they don’t recommend eating yellow snow; evidently it kills corals too. Jane never did her experiment with ordinary ocean water that corals DO grow in. Like why didn’t she just import some Aussie ocean water from the Great Barrier Reef, where corals grow. Toss her “ordinary laboratory blue dye” in there, and then toss some dry ice in to chill it, to see if the corals could survive. If the hcilled GBR ocean water doesn’t go yellow when you chill it, then maybe the corals won’t dye (that’s die). I am somewhat of an expert on fresh water clams, and their effectiveness in growing in acid water; to wit, the California Sacramento/San Joachin/Mokelume Rivers Delta system. A few years ago, while fly fishing for striped bass with my son, in a secret location, in Frank’s Tract, I actually made a total of 25 casts, for a total of 24 grabs with 24 successful landings, and live releases, with an unbroken string of 21 grabs and hookups in 21 successive casts. Heck no they weren’t striped bass, they were fresh water clams. Every one of them had the pointy end of my fly in its mouth; excuse me, shell ! I guess the bed of clams were just sitting there on the bottom, open to catch food coming by in the current, and every one of them grabbed my fly, as it brushed over them. The clams were about one inch diameter, and the fly was about four inches long. For the record, it was a chartreuse and white Clouser, tied on a 3-0 hook. Every one had it’s shell closed on the hook point; which evidently is the tasty part of a Clouser. Yes I did feel the grab, and set the hook on them, but none suffered any damage. It’s still a secret location, because my son and I have never been able to find that clam bed again; maybe I scared them all off to some other place. Instead of arguing about what pH actually means and whether the oceans are turning to HCl /H2CO3or not let us look at the actual observations of ocean surface water pH. Whilst not measured everywhere, ocean pH has been found to vary, daily, seasonally and cycically over longer periods, from pH7,4 to pH 8,3. All reported reductions have fallen within this bracket. Water issuing from the deep ocean black smokers, volcanic vents on the ocean ridge system, have a pH of 4.5 or lower but this rapidly increases the further away from the vent the pH is measured. There is a buffer stage at work in the ocean water, the bicarbonate buffer. This is the next stage in the solution of CO2 in the sea water the first stage being the formation of carbonate ion from the CO2/H2O. This bicarbonate stage increases the pH and is continuous. Remember that sea water is an ionic solution not a simple mixture of chemicals so the identification of H+ in it is no surprise. It is the bicarbonate ions that molluscs etc use in the formation of shell or skeletal frames. During the early Ordovician CO2 levels were up to 8000ppmv but the ocean pH was similar to today’s and molluscs and corals thrived probably due to the excess bicarbonate building blocks reduced energy required to grow shell to divert energy to grow larger. Phew! Weren’t they lucky to have chosen the H+ ion concentration as reference, and not the OH- (OH minus) ion concentration? Remember that in water the two are firmly related – multiplying the two concentrations gives 10E-14. At a neutral pH of 7 both are 10E-7, and at pH of 8.2 the H+ concentration is 10E-8.2, while the OH- concentration becomes 10E-5.8. So, if the water were ‘acidifying’ from pH8.2 down to neutral at pH7.0, some 94% of all OH- ions were already lost, and many would say that pretty much all of OH- is lost already, losing only 6% more cannot possibly have any effect. Therefore it almost couldn’t get any more acidic than that? No catastrophe, everything is safe at this point? Imagine what poor message this would have sent! The flaw in thinking is the ignorance about biological/chemical/physical effects being governed by what is correctly measured by pH, namely the electrochemical potential, as the first commenter has already pointed out. All of the above have an error. pH is NOT described by concentration. It is described by activity. Activity is related to concentration through factors such as as total ionic strength (for dissolved ionic species), the presence of biota, dissolving-but-not-dissolved species, precipitates, colloidal sized solids … all these affect the relation between concentration and activity some in ways that cannot be accounted for with accuracy. A change of 0.1 pH units can be due to the physical properties of a pH electrode, if one is used, or from the abovementioned factors in calculations based on stability constants/phase diagrams. A change of 0.1 pH is in the expected error envelope with seawater – next to nothing. You are all wrong, wrong, wrong. Were you not taught Debye–Hückel theory in first year Chemistry? Geoff, of course activities are the quantities that matter, but at these concentrations of hydrogen ion, it won’t matter if one uses concentrations or activities to calculate the relative increase in [H+] from the given change in pH. The Debye-Huckel theory, even extended, breaks down at concentrations > 0.1 m. With an ionic strength of 0.7, seawater is outside the realm of normal activity theory and any measurements of pH have to be done empirically-hence the modified pH measurements and revised buffer standards made from artificial seawater discussed above. Assuming that the current average of 8,1 for seawater pH is based on a corrected measurement, how could the measurement from the beginning of the Industrial Age have any meaning in this context when it was made long before theory and accurate measurement were available. To become acidic the hydrogen ion content of the sea water offshore from Oregon would have to increase 6121% more than the 26% (not 30%) change. The measurement was over a one century period. This means that 6121 years from now the ocean near Oregon will become acidic. It is hard to really generate a sense of immediacy or panic for a time period greater than the written history of mankind. Indeed. The 0.1 pH drop has no meaning because it is not based on measurements. So, the centennial 0.1 pH reduction is computer model garbage, regardless of the units. We don’t even have adequate measurements of the average global pH of the oceans TODAY! Jane Lubchenko is no dummy, though. She is responsible for increasing NOAA’s budget as much as possible. She requires misleading or alarmist claims to compete with NASA GISS. In other words, after spending 10 years taking pH measurements at one coastal location (Tatoosh Island, Washington), they have no idea what is going on with ocean pH. The rest of my comment dealt with an increase in hydrogen (I suppose Hydronium is more correct these days) ion concentration and I slipped up in one sentence – you are correct, of course. My main point was that to go from pH8.2 to pH1.0 required an increase in [H+] of 1,584,893,200%. I was startled that a chem prof of all people would not understand the delta pH significance. Chem Prof seems to have misunderstood the nature of the complaint. The ion concentration is not the acidity (or alkalinity) as munderstood in pH. It is not used to derive the pH from -log10 of H+ ions. The measurements of the ocean are of pH. The ion concentration is derived from the pH. Not the other way round. And the pH is not that accurate. +/-5% (calibration slope of 95%) is the industry norm; all the buffering standards assume that. So 30% change in ion concentration is less than the calibration error that derives the measurement of pH at the pH of the ocean. The complaint is right. NOAA is not just misleading, it is wrong. How about the impacts of run off / effluent from nearby land areas? In reading your article a couple of questions arose. 1) Can the researchers studying the “acidification” issue distinguish between CO2 from deep ocean upwellings and that from the atmosphere? 2) Since increasing atmospheric CO2 is a global phenomenon, why is the pH change from it occurring faster in Washington than in Hawaii? 3) Is anyone taking regular pH measurements for Willapa Bay and if so, with what periodicity? He responded back right away. Unfortunately his responses were not that helpful. To my first question he provided a link to a story that said nothing about identifying the source of CO2. To the second he referred me to the part of his story saying that it had to do with how upwellings hit the NW coast. I could tell from his response that the possibility never occured to him that the increase could be primarily these currents. After a followup email to him, he referred me to Dr. Feeley. I’ve been debating whether or not it is worth my time to contact him. I get the feeling that the press and perhaps a good number of researchers do not understand the importance of wanting to sift the wheat from the chaff. When nearly everything gets tied back to climate change these days, how is the average citizen supposed to figure out what is a real problem needing to be addressed and what is simply speculation. This is not about politics. It is about arithmetic and simple arithmetic functions. nothing about non-ideal behavior of hydrogen ion in solution. This is incorrect. The pH scale is open-ended. that is how the story was reported and it is wrong. That is it. No mention of pH. How do chemists describe how much of a given substance is present in a solution? of a given type and (b) the volume of the solution measured in liters. hydrogen ion in a liter of solution. water are very large” ? I have no idea and it is irrelevant. “As a Chemical Professor – cough! – you will be aware that there is a p[OH] measure too. arithemetic: 1.26 x 0.794 = 1.00 . Heritability allows us to examine how genetics directly impact an individual’s height. (dietary habit and lifestyle). The man is five centimeters taller than the average. variants, whereas one centimeter is due to environmental effects, such as nutrition. in spite of a 200 cm wide variation in human height. theory plays no role in this whatsoever. units of pH. I have never seen work- ups in ion concentration” and misses the point again. Let me some this up with an analogy: Let’s say you’re a company being accused of paying “slave wages”; but you state that you’ve increased wages by 30%. A 30% increase is meaningless without knowing 30% of what. If you’ve increased wages from a penny an hour by 30% that’s still “slave wages”. The press release similarly misleads the average person because they may not know what the total is the 30% is in reference to. It’s unethical zohneristic advocacy, not objective science. But any chem prof would know that it is incredibly inappropriate to apply percentages to pH’s instead of thinking that is somehow ironic. BTW: Chem Prof, I’m doubling … nay, tripling the money I’m paying you to post here.